Sweyn Forkbeard or Tiugeskaeg, known as such due to his long cleft beard was the son of Harald Bluetooth and was born around 960 AD; he would be the first Danish King of England. Sweyn formed imposing Danish North Sea empire. His father was King of Denmark from 940 to 985 AD, and while it is unknown who his mother was, he may have been his father’s illegitimate son born from Aesa according to the Jomsvikinga Saga or from Queen Gunild. Succeeding his father as King of Denmark in 986 AD Sweyn was married twice, to Gunhilda the daughter of the Duke of Poland and then secondly to Sigrid the Haughty the widow of the King of Sweden after he repudiated his first wife. Harald Bluetooth was the first Scandinavian King to accept Christianity though Sweyn was never known to embrace his Christian name of Otto. Sweyn was tolerant of paganism while favouring Christianity and many have argued it was politically motivated in his attempts to conquer the mostly Christian England and gain favour with the English Church. Sweyn’s first military expedition was a revolt against his father, Harald who was killed in the conflict and he allied with Palnatoke, a famous Viking to accomplish this endeavour. Swevyn also attempted a large Viking fleet invasion on the shores of England and failed to capture London which was his ultimate goal. The King of Sweden, Eric Sersel, used Sweyn’s absence to occupy Denmark and Sweyn was only able to reclaim it upon the King’s death in 994 AD. Six years after this, at the Battle of Svolder in 1000 AD, Sweyn allied with the Swedes and defeated King Olaf I Trygvessön of Norway, occupying and dividing the kingdom. There is proof that Olaf’s treatment of Sigrid was instrumental in his downfall. Sigrid turned down his proposal based on that she would have had to convert to Christianity to marry him. Upon her refusal, Olaf struck her, and she responded, “This may some day be thy death.” With her husband Sweyn, they were able to create a coalition of Olaf’s enemies to bring about his rule and occupy his kingdom. The coalition included the Swedish King Olaf Skötkonung and the Norwegian Erik, the Earl of Lade. After the defeat, Sweyn became the virtual ruler of Norway although he shared sovereignty with his allies. 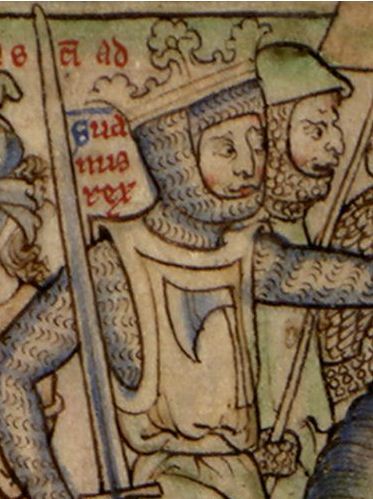 Though Sweyn failed in his first expedition to occupy England he successfully blackmailed the weak King Ethelred II the Redeless into paying retribution. Ethelred decided to pay Sweyn to return to Denmark and leave England in peace; this tax became known as the Danegeld. On St Brice’s Day, 1002 AD, the King ordered a massacre of the Danes in England, which included men, women and children, two of these Danes killed were rumoured to be Sweyn’s sister, Gunhilde, and brother in law. Sweyn swore an oath to avenge his slain countrymen and landed in England in 1003AD, ravaging the South Country, Northumbria surrendered to him, and he proceeded with his forces to Winchester and on to London. The Londoners put up such a hearty resistance that Sweyn left to Bath who submitted to him and finally the Londoners fearing their downfall and an awful revenge if they did not forfeit submitted to Sweyn. King Ethelred managed to flee to the Isle of Wight and was late able to join his wife and children in Normandy which allowed Sweyn to be declared King of England on Christmas Day of 1013AD. Sweyn had no dynastic right to the throne and had claimed the throne by right of conquest so many of the English provinces refused to acknowledge him as their rightful King thus he was never formally crowned. England’s first Danish King died of apoplexy soon after his success, and thus Ethelred was reinstated as King after managing to drive Sweyn’s son Canute, who was proclaimed King by the Danish fleet in England to flee the country. Harald II, his other son, succeeded him as King of Denmark. While Sweyn was buried in England, his remains were eventually moved to Roeskild Cathedral in Denmark. Cnut would return in 1016 AD and once again become King of England, as well as ruling Denmark, Norway and parts of Sweden. Between Cnut and his sons, the dynasty would rule England for twenty-six years. After the death of Cnut’s son, Harthacnut, the English throne reverted to the House of Wessex. 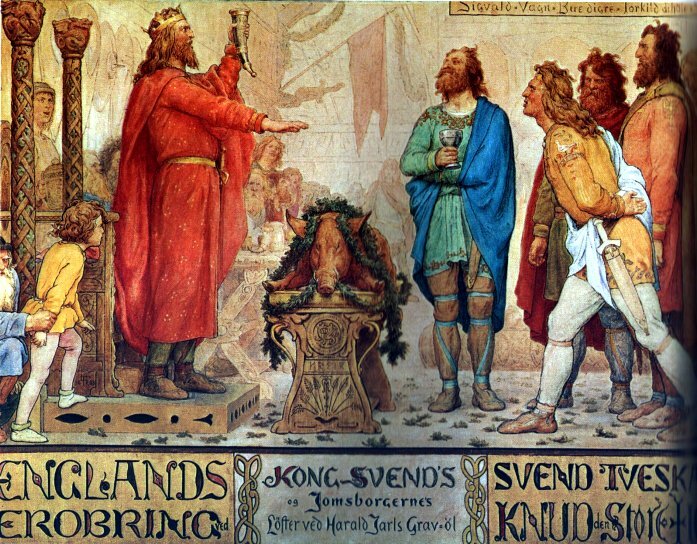 King Sweyn’s descendants through his daughter Estrid continue to reign in Denmark today. Margaret of Denmark, a direct descendant, married James III of Scotland in 1469 introducing the bloodline in the Scottish royal family. Sweyn’s decedents became monarchs in England once again in 1603 after James VI of Scotland inherited the English throne. Sweyn is often referred to as England’s forgotten King, due to his short reign of only five weeks. Nonetheless, he not only established Danish monarchs in England but led successful military campaigns all over Europe and changed the face of European politics for years to come due to his successes and his son’s accomplishments as rulers.